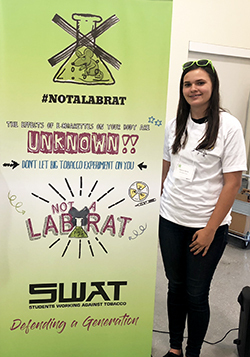 At the Students Working Against Tobacco (SWAT) regional meeting on June 9, Mariah Spelts of Okeechobee County was elected as a Region 4 Youth Advisory Board (YAB) representative by a consensus of SWAT Youth from Indian River County south to the Florida Keys. SWAT is Florida’s statewide youth-led movement to combat the tobacco industry. The SWAT Youth Advisory Board is a sixteen-member group of students who are elected annually by their peers to serve as regional representatives and youth advisors for the statewide tobacco program. There are four representatives elected for each of Florida’s four tobacco control regions. The Youth Advocacy Board works in collaboration with the Florida Department of Health’s Bureau of Tobacco Free Florida to help plan SWAT organization’s direction and goals and provide input on the state’s youth prevention efforts. Students work with county grantees to support initiatives that educate their peers about tobacco use, help protect youth from tobacco, and strengthen local policies. Spelts plans to focus on changing the social norms that using tobacco makes you cool and working with local tobacco staff to help educate the community of the harmful effects of Electronic Cigarettes. For more information on local youth tobacco prevention efforts, visit www.swatflorida.com or www.TFP-Okeechobee.org.